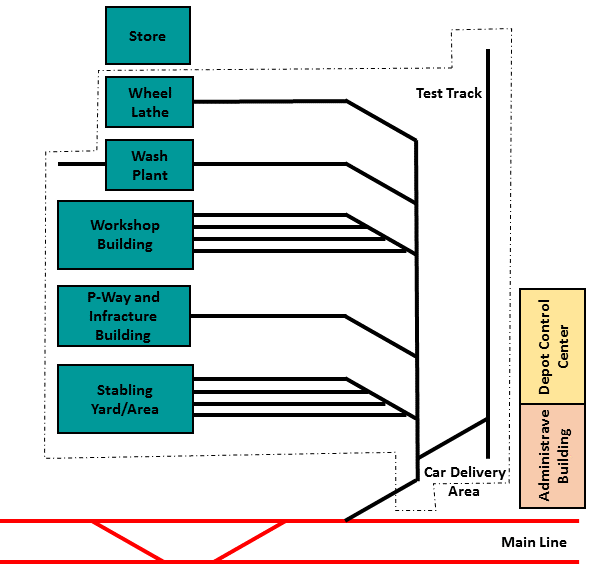 Stabling Area is a place where trains are parked when they are not in operation. 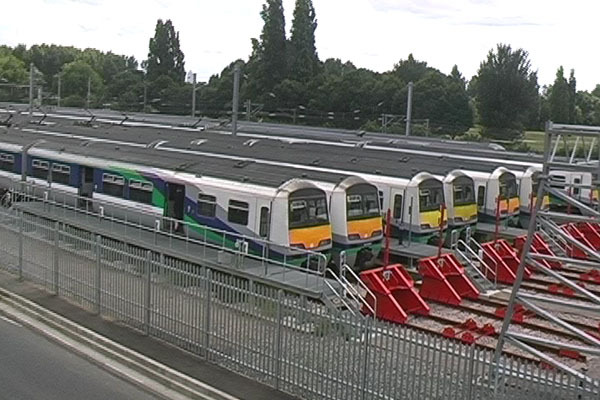 Typically, trains return to the stabling facility at the end of service and until they are required again. 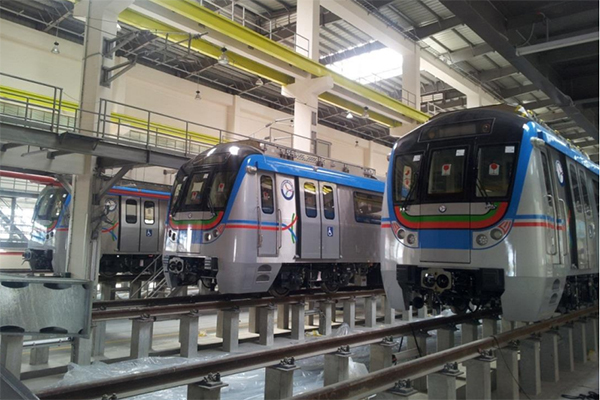 Servicing requirements shall be determined from the Rolling Stock manufacturer. Electrical equipment like transformer, converter/inverter, circuit breaker, relays. Cross track equipped with bogie turntables have been provided for movement between bays. 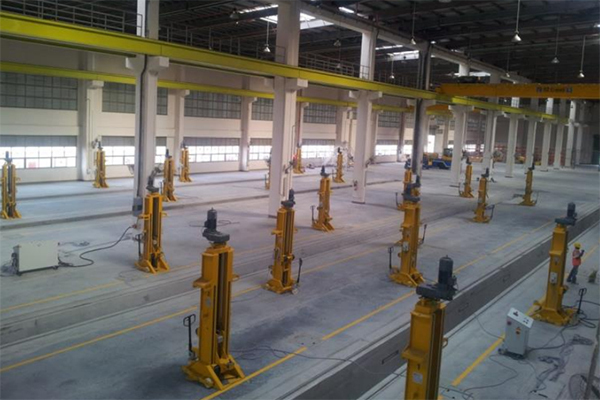 These lines are used for heavy repair workshop for trains. This line do not have OHE. Shunter to be used for hauling any train in these lines. 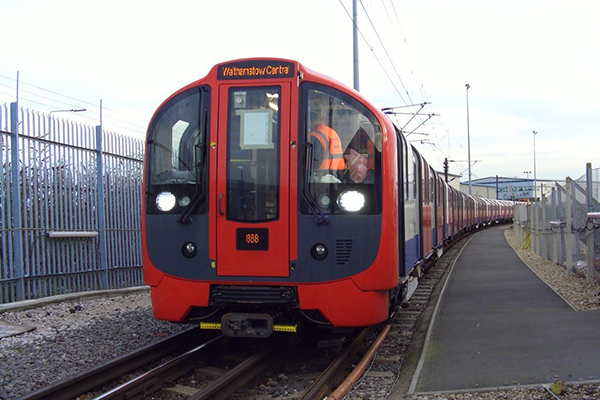 Attending any under frame system is also available in this lines This lines are equipped with lifting system. The rolling stock wash plant is used for removing dust, greasy dirt and other stains on the exterior of EMU, locomotives, and metros etc. The wash plant automatically wash the two flanks, front and rear ends, the vehicle top side slope, door and window glass by chemical and physical effects of water and detergents and washing brushes. 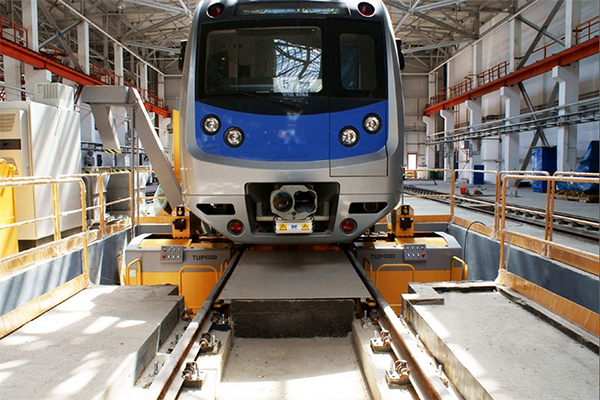 This line is used for internal testing of train and other systems. Test track is equipped with signaling equipments (ATP/ATO). 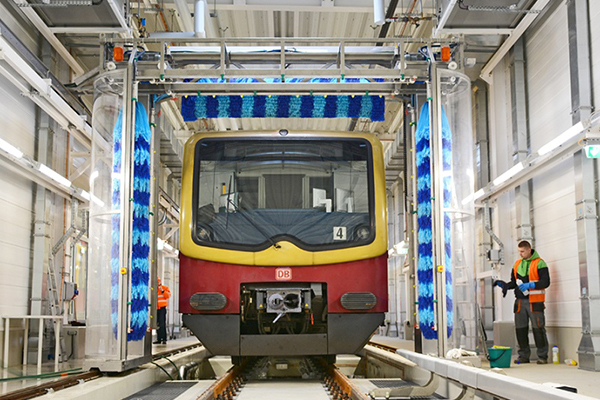 It is used for the commissioning of the new trains, their trials and testing of the trains after the Intermediate Overhaul (IOH) and Periodical Overhaul (POH). In compliance to safety norms, the boundary of the track shall be completely fenced to prevent unauthorized trespassing across or along the track. 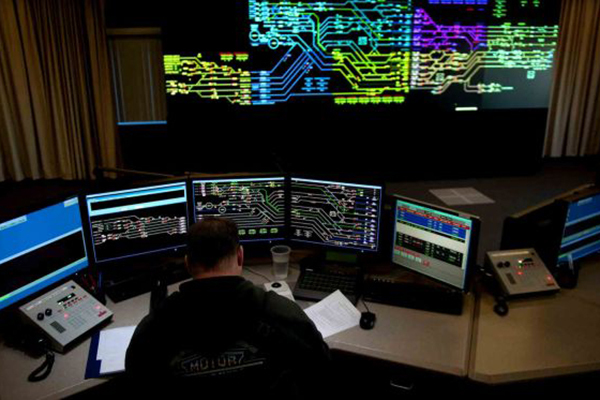 Control of train operation will be done centrally from Operations Control Center (OCC), which will house Traffic Control Centre, SCADA System for Traction Power Control & Monitoring, SCADA System for Auxiliary Power, VAC Control & Monitoring, Telecommunication, CCTV Control & Monitoring etc. Movement of trains inside depot shall be controlled from Depot Control Centre (DCC) located inside the depot. An administrative building close to the main entrance is planned. It can be suitably sized and architecturally designed at the detailed design stage. A security office is also provided close to main entrance. It is equipped with suitable Access Control System for all the staff working in the complex. A P-way building is provided with local workshop and offices with road and rail access for stabling and maintenance of Maintenance Vehicles. The under-floor wheel lathe will simultaneously machine the two wheel treads of each wheel-set. This under-floor wheel employ the state-of-the-art CNC or microprocessor technology. The lathe is equipped with an automatic wear-measuring device to achieve the minimum removal of wheel material. The newly procured coaches, which are transported by road, shall reach the Depot Workshop by the road on trailers. To unload the coaches and bring them to the track, provision of space, along the side of shunting neck, has to be made for unloading of cars and other heavy materials. 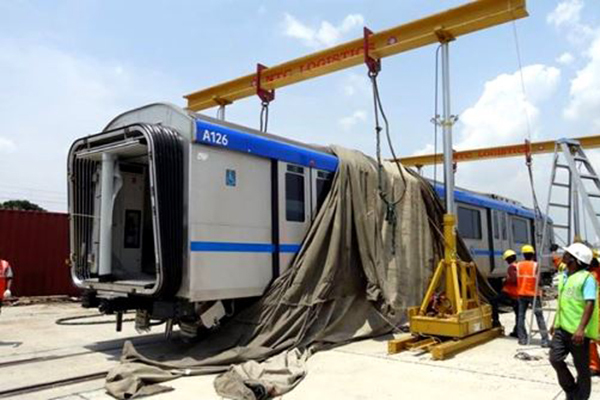 There should be enough space available for movement of heavy cranes for lifting of coaches. The unloading area should be easily accessible for heavy duty hydraulic trailers. 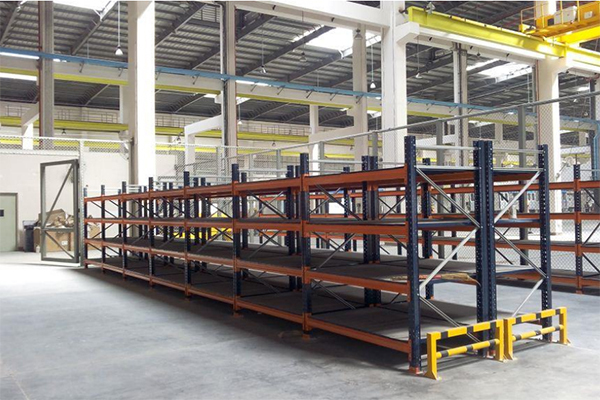 Storage facilities are provided to ensure that all appropriate spares, parts, tools and consumables are delivered to and issued from a single main store with as few sub-stores as practical. Accommodation of the complete range of spares and supplies, for the maintenance and operation of the rail system are provided.